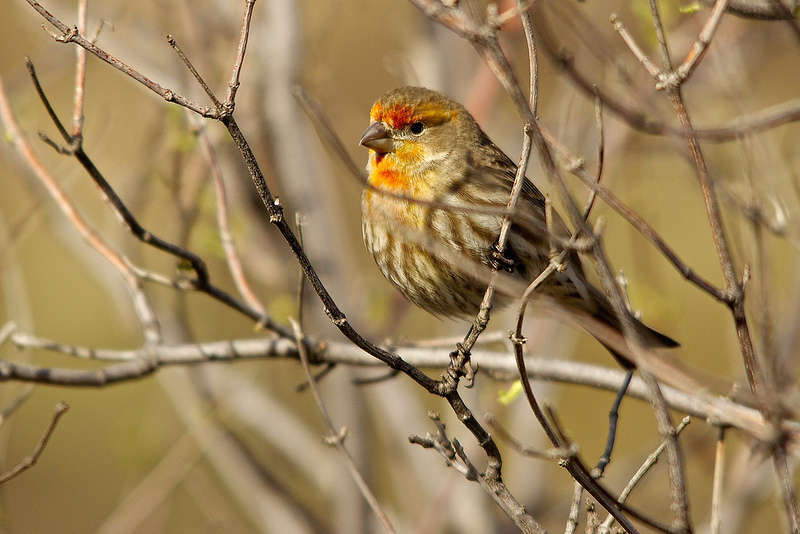 Male House Finches come in several colors, from the most familiar red shading through orange to bright golden yellow. They use carotenoids acquired from their diet to make these bright colors, and the colors are a sexual trait used to attract female mates. Extremely scientific diagram of male House Finch color variation. The conventional interpretation of this system might go thus: the males try to be as red as they can, and so the best males achieve redness, while intermediate males are orange and poor-condition males are yellow. If this was true, you would expect 1) females to prefer to mate with red males, and 2) red males to have the most surviving chicks. After all, that’s the point—to produce as many healthy kids as possible. Both of those expectations are true—at first. For birds in their first year of breeding, redder males are in the best condition, females prefer them over the other colors, and the redder males have the most surviving chicks (Badyaev & Hill 2002). Yeah red males are the best. But then things get complicated. First, those yellow males in their first year aren’t just sitting around being bad parents. They breed later than the red males, which is bad because earlier nests do better, but they feed their chicks much more than the red dads do. The red dads’ chicks only survive because the females are willing to work extra hard to make up for their beautiful, lazy red mates. And they are lazy—they’re no less able to help out with feeding the chicks than the yellow guys are, but they don’t. Because they don’t have to do such stressful work, they survive to the next year better than the yellow males (Duckworth et al. 2003). This strikes me as extremely unfair. It’s not all good for the red males, though, because things change when you consider birds who are experienced breeders—that is, who have already bred at least once. Experienced females don’t prefer the red males; they prefer males who feed the chicks more (Badyaev & Duckworth 2003). This makes sense when you consider that feeding the chicks is hard work, and the females don’t want to have to do everything themselves. It also has the strange effect that the selection pressure on males to be red can depend on what proportion of females in the population are first-years: the more females are inexperienced youngsters, the more advantage red males will have over other colors, since it’s only the young females who prefer red males. But I’m red! Come back, hon! For older males, color is not determined as much by their condition: an awesome older male might be yellow, instead of red. Or a not-that-awesome older male might be red. It looks like developing red plumage may become easier with age, so that while only great-condition birds can be red in their first year, older birds don’t have to work so hard to get that crimson hue (Badyaev & Duckworth 2003). Males don’t necessarily stick with the same color throughout their lifetimes. There is a great sequence of photos in Badyaev & Duckworth 2003 showing males over three years. Some start out yellow and turn red, some start red and turn yellow, some stay red all their lives. Males who don’t manage to attract a mate one year tend to be redder the next year, hoping to seduce a young female. Males who breed successfully one year seem to be able to be any color they want in the next year. 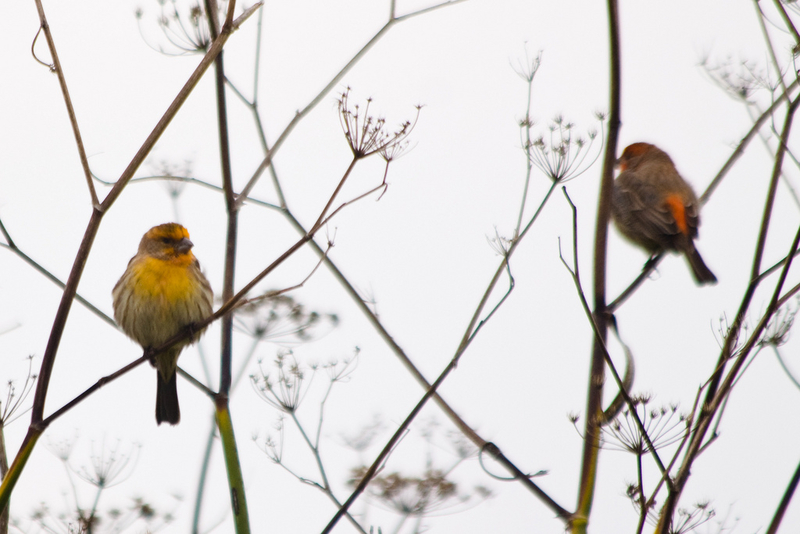 In older birds, it isn’t the early-breeding, lazy red males who are the most successful at raising chicks. It’s orange males, who compromise between the colors: fairly early breeding like a red male, a substantial contribution to feeding the babies like a yellow male. The optimal combination of those lets orange males raise the most chicks (Badyaev & Hill 2002). This is a great example of something we increasingly find in the natural world: that patterns are often state- or context-dependent. Red indicates better condition, better reproductive success, and an easier time finding a mate only if the context is that you’re a first-time male breeder. Orange is the best color only if the context is that you’re an experienced breeder. If you don’t realize that context matters, then everything just looks like a patternless muddle. When you do appreciate the importance of context, everything starts to look really complex and interesting. It shouldn’t be complex. Red should be the best, period. Hmph. Badyaev AV, Duckworth RA. 2003. Context-dependent sexual advertisement: plasticity in development of sexual ornamentation throughout the lifetime of a passerine bird. Journal of Evolutionary Biology 16:1065-1076. Badyaev AV, Hill GE. 2002. 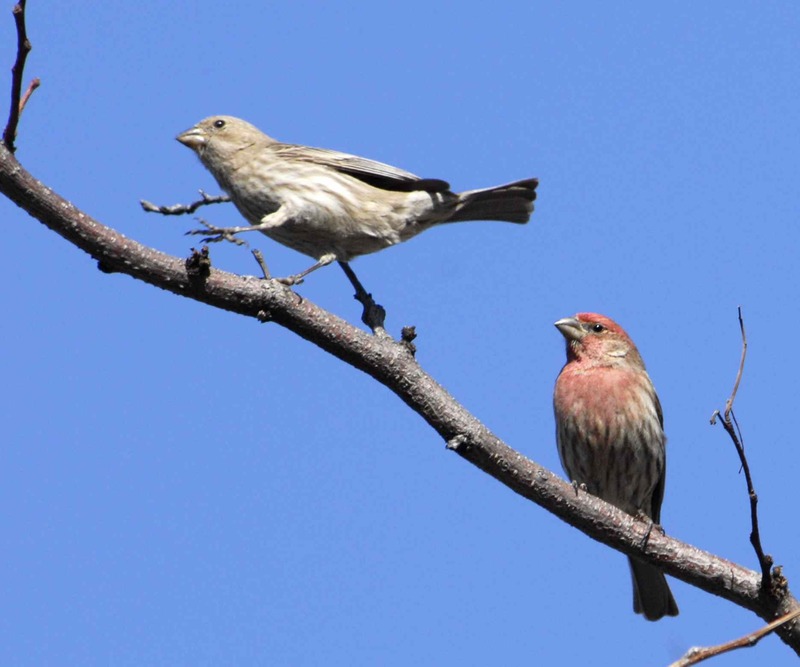 Paternal care as a conditional strategy: distinct reproductive tactics associated with elaboration of plumage ornamentation in the house finch. Behavioral Ecology 13(5):591-597. Duckworth RA, Badyaev AV, Parlow AF. 2003. 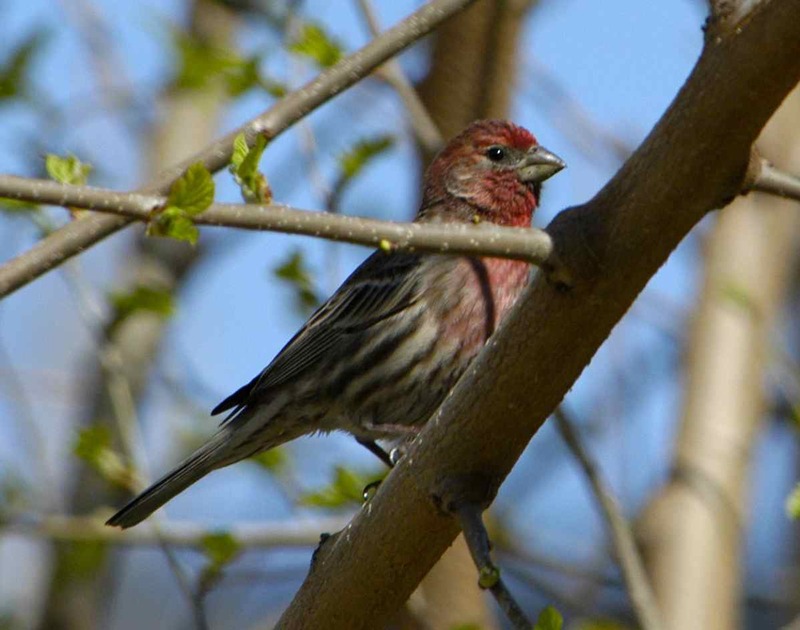 Elaborately ornamented males avoid costly parental care in the house finch (Carpodacus mexicanus): a proximate perspective. Behavioral Ecology and Sociobiology 55(2):176-183. 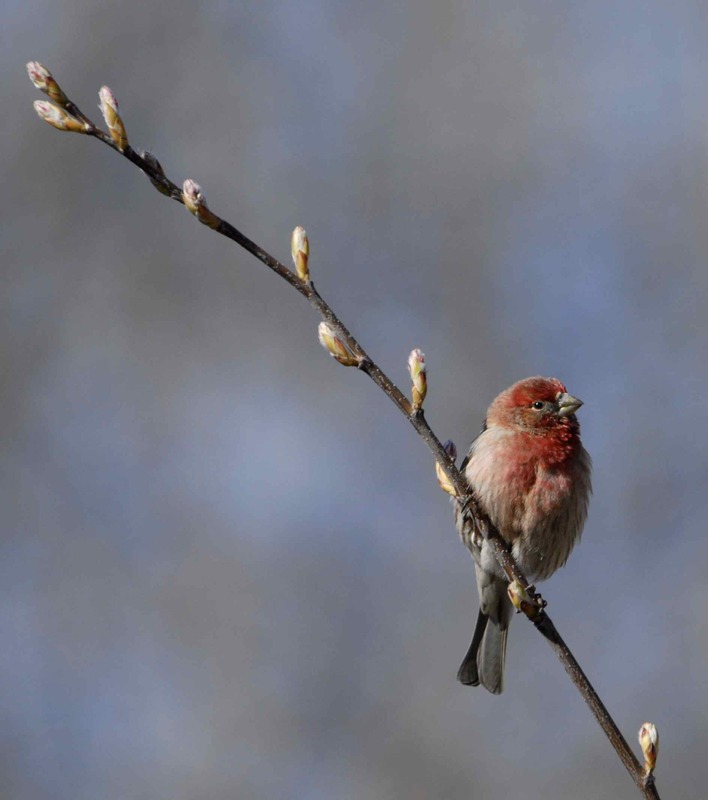 This entry was posted in general science-y stuff, other people's research and tagged biology, birds, color, House Finch, parental care, science by toughlittlebirds. Bookmark the permalink. I hope you write a book someday! My son saved a chick that fell out of a nest during a storm. I am feeding it baby parakeet food with the back of a teaspoon and it seems to be thriving. We would like to release it back into the wild when it can fly, but the lady at the petshop says it will not survive. Can you please give me an opinion on that and also some advice on the kind of food that is recommended. I’m not a wildlife rehabilitator or a vet, and I would need to know the type of bird to give any advice even if I was. PLEASE PLEASE get in touch with a wildlife rehabilitator, they are trained to raise wild baby birds, which is very difficult – baby birds can get sick and die very quickly with improper care. See http://www.nwrawildlife.org/content/finding-rehabilitator on how to locate a wildlife rehabilitator near you. Please contact one of these experts to give your chick the best shot at survival. (“The lady at the petshop” is definitely not an expert on wild birds!) Many chicks are successfully raised and released back into the wild by wildlife rehabilitators each year, where they can be happy wild birds. Great post! I love reading about complex selection pressures and competition. It is always so tempting to anthropomorphize these things, which I know is a mistake, but it is just so darn fun. Like, what woman hasn’t looked back on her youth, to when she dated those hunky-yet-douchey dudes, and shuddered at how naive she was back then? Great read! 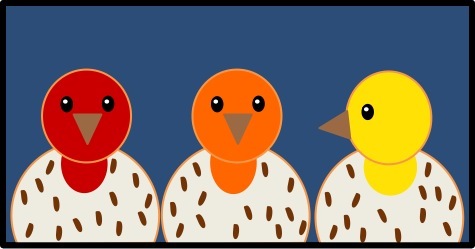 Did the research follow the activities of the birds after they changed colors? Like did an orange bird that changed to yellow appear to have less desire to mate? Did the red bird that changed orange become a better father? Did the yellow to red become less responsible with babies and more of a wild guy? Very interesting article. It makes these “common” birds most more interesting. 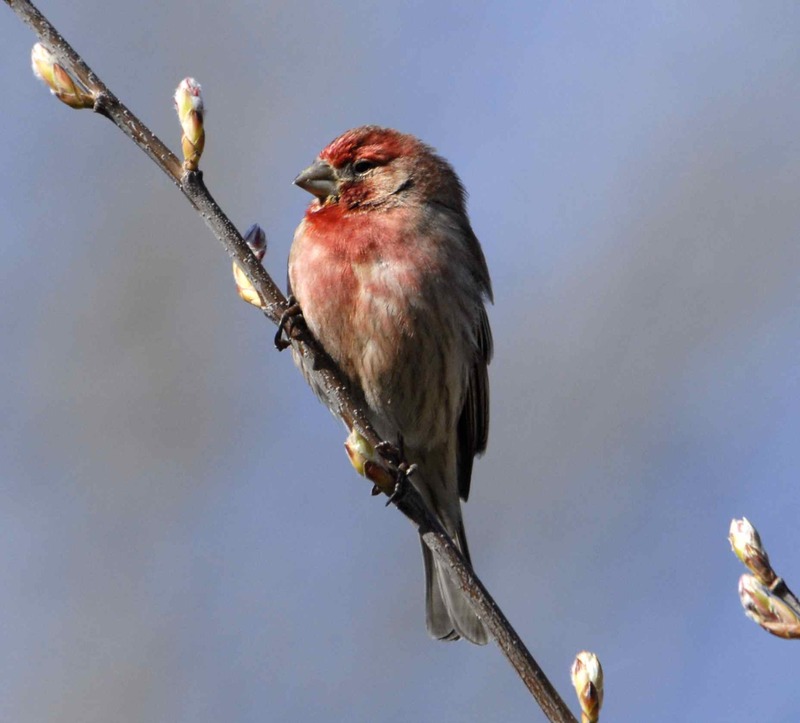 At what age does a male house finch get his color? They should molt into their colorful feathers in their first fall. 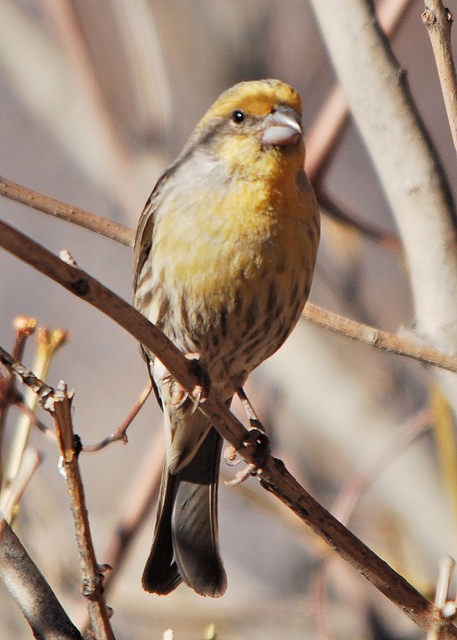 In Arizona, males had their colorful plumage by 90-120 days of age. This is very well written. It takes very talented writing to translate science like this. Does that mean the male’s temperament toward feeding nestlings changes with his colors? It is noted the red males don’t help with feeding the babies. . and they can change color over time. So when that same male becomes yellow, does that mean he now furtively feeds the babies, and if he goes back to red, he stops? Interesting. I realize you wrote this a few years ago but I have an orange finch in my yard right now amongst all the very red ones so I found this interesting. Sounds like he will do A-OK in the long run.